Anti-government protests have swept across the Central Asian nation of Kyrgyzstan and riot police have opened fire on thousands storming the main government building in the capital of Bishkek. The government says at least 17 people have been killed and least 180 wounded in clashes Wednesday, The Associated Press reports. Local media reports said Kyrgyz First Vice-Prime Minister Akylbek Japarov was also seized by protesters at a square in Talas. Broadcasting was interrupted for approximately one hour after demonstrators seized the building of the state television channel KTR in Bishkek. 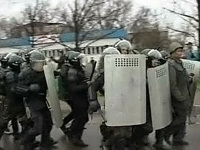 Opposition representatives and human rights activists appeared on the state TV channel when broadcasting was resumed. Kyrgyz Prime Minister Daniyar Usenov declared a nationwide state of emergency while authorities have imposed curfew in Bishkek, RTTNews informs.